I was short on cash when I went uptown this morning, so I was aghast to discover that the ATMs of my bank in two branches were all offline. Desperate, I knocked on the glass door of the second branch and security guard was good enough to tell me what the matter was. “There’s a fire near the market, Sir!” he told me. Well, that explained it! Power was cut in the city proper as a precautionary move. With what little cash I had, I walked on to the market to get the things I went uptown for. I scanned the skies for the tell-tale black smoke. There was none. 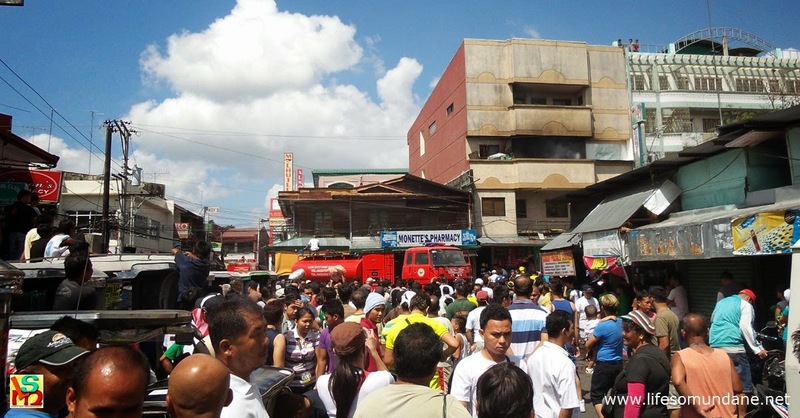 Of course, when I neared the frontage of the market, I immediately knew where the fire was – to the left of the market. I could not see smoke; and neither could I see fire. Instead, I could see people scurrying. Something in the demeanour of the people hurrying immediately told me that they were scurrying towards the fire rather than away from it. I cannot recall whose story it was that when hundreds of Japanese bombers blacked the skies over Manila flying in formation back in World War II, people actually came out of their houses to watch in awe. This in itself was a relief because it immediately told me that the fire was either already under control or was never significant to begin with. When I got to the street corner, I turned to the left and saw the small crowd that had gathered. I was in no hurry; so I allowed curiosity to get the better of me and went to investigate. The fire was in that three- or four-storey building across the street from the public market. 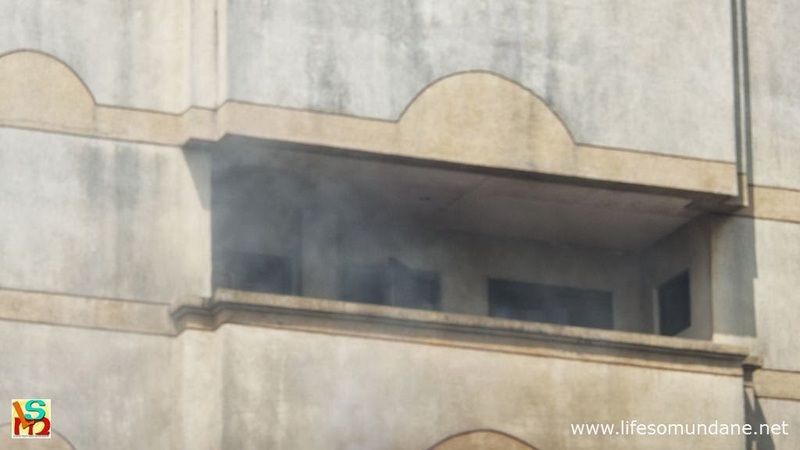 There was greyish smoke coming out from the second-storey window as a team of fire fighters sprayed water into it. All that was missing from the scene were movie cameras and Robin Padilla. The way the crowd behaved, it was as though people were watching a movie crew shooting a scene. The crowd was well-behaved, in fairness. Everyone was backed away at a respectful distance to allow the fire brigade to do its work. When a white van with fire personnel arrived, the crowd respectfully made way. Ditto when the fire truck arrived. There was no fear at all. People gawked at the scene more out of curiosity. Quite a few had their cameraphones aimed at the scene happily recording the proceedings, notwithstanding the fact that it was a hot and dry day. The fire was next to the dry market, which meant that the fire could have easily gotten out of hand. In fact, the fire made the regional news. I must have arrived when the fire was nearly put out, because the news ran a video showing the building still ablaze. Just to illustrate how quickly things could have become worse, the news report said that it was fortuitous that the fire did not reach a stockpile of firecrackers on the building’s second storey. The stockpiling of firecrackers is illegal, the news report said. I really do not know what it is about us Filipinos that makes us so blasé about things that can potentially do us harm. It must be because living in the Philippines is something akin to a game of Russian roulette; and that we have all become inured to disasters. We are a hardy lot, are we not? Curious, too! And curiosity, they do say, killed the cat. What is it about us that we will willingly put ourselves potentially in harm’s way just to satisfy our curiosity? 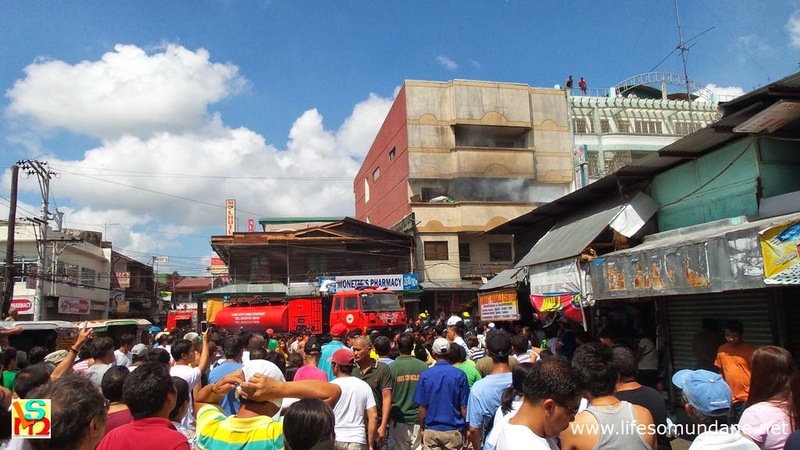 Granted, that fire this morning in Lipa was not very significant. On the other hand, had the flames reached the firecrackers, the fire could quickly have become unmanageable! Still fresh in my mind, of course, are scenes of people following street battles between loyalist and renegade soldiers during the many coup attempts staged in Cory Aquino’s presidency. It was simply ridiculous! People behaved as though they were watching an action movie, seemingly oblivious to the fact that the soldiers were actually shooting live ammunition! I cannot recall whose story it was that when hundreds of Japanese bombers blackened the skies over Manila flying in formation back in World War II, people actually came out of their houses to watch in awe. The skies must have looked magnificent. Until the bombs started falling down upon the watching multitudes! Now if you are wondering if the pictures in this article are from the fire this morning, well, yes they are! I am Filipino, after all. So I happily snapped away as others were also doing. By the way, today was the last day of the Bureau of Fire Protection’s Fire Prevention Month.